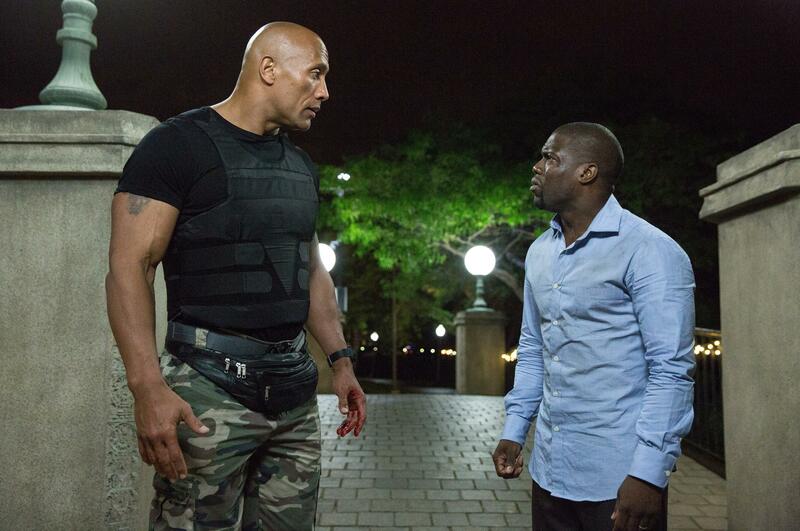 NEW YORK – On their first day shooting “Central Intelligence,” their new spy-themed action comedy, Dwayne Johnson and Kevin Hart were given an extremely difficult scene. Difficult, meaning it was impossible not to break up laughing and ruin the shot. They were playing doctor and patient in a therapist’s office, and they were staring at each other, real close, trying not to blink or speak. For Hart especially, this was very hard to do. Thurber says they eventually nailed the scene, but “literally if you saw one more frame, you’d see Kevin break up.” As for Johnson and Hart, they say that early scene set the tone for their chemistry during the rest of the shoot. AP: Dwayne, just a quick question first – how did you like working with (“Hamilton” creator) Lin-Manuel Miranda on the music for the Disney film “Moana”? JOHNSON: Oh, awesome, awesome. I mean, he’s really a brilliant guy. HART: Wait, was it better than working with ME? JOHNSON: (Feigning panic.) No, no! Not better than you. No one’s better than you. HART: I mean, not that I’m insecure about it. AP: OK, let’s move on to that staring scene. JOHNSON: It’s the funniest thing, still to this day that I have ever done, that’s ever broken me up like that. And you see it in the outtakes, it was very real. HART: It was me who was breaking up. 100 percent. He stayed locked in, and I just couldn’t. JOHNSON: That was day one, and that was really an indication of how the rest of the movie was, for us, just in terms of chemistry and in terms of friendship. It all happened extremely quickly. AP: Did you know each other before? JOHNSON: We’d met very quickly backstage at the Teen Choice awards. It was a quick ‘Hey, good to see you, big fan, big fan,’ and we were gone. Then the opportunity came to make the movie together. And the moment we got on set, it was instantaneous. AP: Sometimes as a viewer you’re never sure if it’s real. But it looks like you’re having a really good time. HART: In this case, we are. JOHNSON: Yeah, you never know, right? (Laughs). Sometimes in our world and our business, people, you can’t really tell how they are until you meet them, and when you meet them and you’re in bed (in terms of the project) and you’re like, ‘Oh my god, this is going to be a long one’ … Here you had THE biggest comedic star in the world, big movie star, all these amazing things … It could have easily gone in a different direction where people get insecure, want to have the jokes for themselves. But not with Kevin. HART: It was a valuable team effort. At the end of the day, we’re helping one another. AP: This movie’s about high school, and going back, in a way. Did you ever want to go back and correct something from high school? JOHNSON: I did, and it was only until I actually became successful and got a little older … that I started to appreciate what had happened in high school, and the challenges. For a long time I wanted to correct it, take it back, but it wasn’t until I got older that I realized it all happens for a reason. AP: Did you two have to stretch yourself for this movie? JOHNSON: The interesting challenge was (finding) the balance in Bob … a CIA operative with the other side of his brain that did not develop past 18 years old. So to find that balance, a Jason Bourne with um, Tom Hanks in “Big,” that was pretty challenging. HART: It was different, which is why I jumped at the opportunity. … So many of the other characters around me were funny, were responsible for the jokes … I was adamant about that, making sure that the director and myself communicate and that I don’t cross a certain line. Making sure that I don’t always TRY to be funny in moments where I can. That’s a big thing. Published: June 16, 2016, 10 a.m.